Hyperpigmentation is the term given to describe an excess production in melanin pigment. Resulting in brown spots or darker patches of skin and uneven skin tone. In this blog post we’ll be reviewing the different types of hyperpigmentation. Including Solar lentigines, Post Inflammatory Hyperpigmentation (PIH) and Melasma. To understand the causes of hyperpigmentation we must first understand how melanin is produced, a process known as Melanogenesis. Melanogenesis is a complex process of melanin pigment production following UV exposure, which triggers the biosynthetic melanogenesis pathway. UV is primarily responsible for triggering all the following steps in melanogenesis. Beginning with Propiomelanocortin (POMC), formed by the pituitary gland and the precursor to the melanin-stimulating hormone (MSH). MSH then adheres to receptors on the keratinocytes & melanocytes cells. This triggers the production of Tyrosinase, the enzyme which acts as the catalyst for melanin production. L-Dopa & Dopa Phosphates are regulators & building blocks for the pigment melanin granules called melanosomes. Melanocytes create the pigment granules and then transfer them to the keratinocyte via their dendritic legs called Melanocyticdendrite. Keratinocytes then absorb the melanin granules which form to provide UV protection. The keratinocytes are responsible for distributing the pigment melanin granules up throughout the stratum corneum. 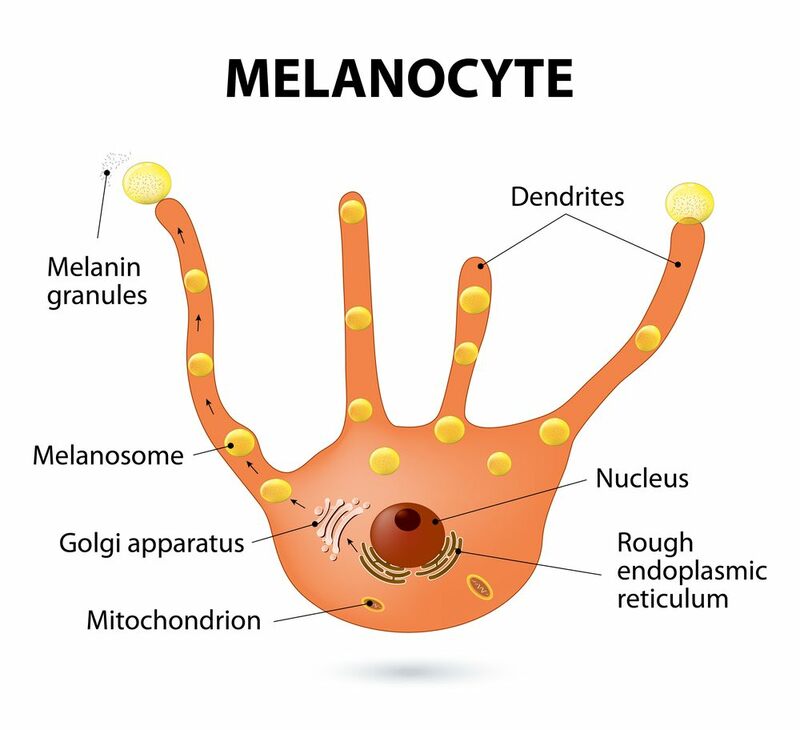 Melanocytes are able to produce different forms of melanin pigment. Phaemelanin is red in colour and Eumelanin is brown. It is Eumelanin that provides UV protection and more abundant in darker Fitzpatrick skin types. Interestingly we all have the same amount of melanocytes present in the skin, regardless of skin colour. However darker skin types can make more of the brown pigment (Eumelanin) and the molecules are also larger. Deviated skin types that have mixed heritage means that their skin may appear fair but in fact can tan well in response to UV. These skin types may show concerns related to both fair skins (such as freckles) and darker skin (such as PIH). As you can see from the Melanogenesis pathway, there are multiple stages involved. Which means, Multiple opportunities for it to go wrong. 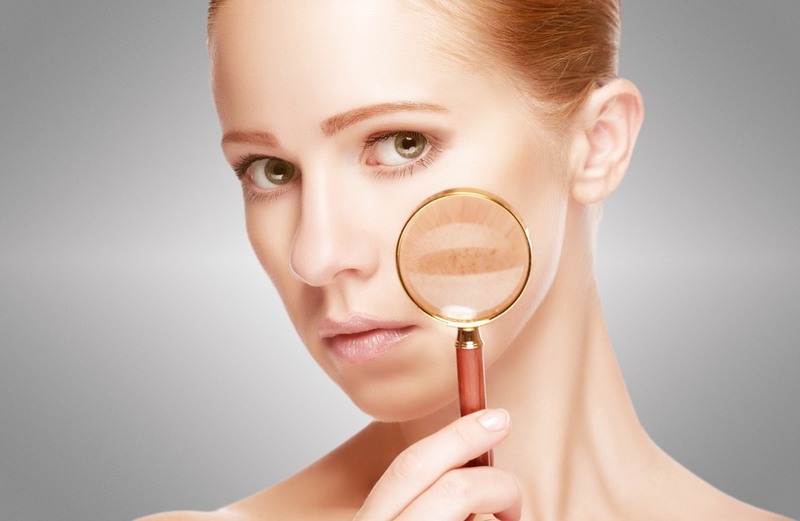 Generally speaking there three main causes of hyperpigmentation. UV Damage to the melanocyte; Inflammation which triggers an over-production of melanin and / or hormonal factors, as in the case of Melasma. Now we’ve had a brief overview of the melanogenesis pathway we will now review the different types of hyperpigmentation. Freckles or Ephelides are the most common type of pigmentation. These develop after repeated sun exposure and are particularly common in Fitzpatrick 1 and 2 skin types. Heredity influences are also involved with this type of pigmentation.They will appear darker during the sunny months and tend to fade in the winter months. Solar Lentigines are caused by UV exposure and often referred to as sun spots and appear as pigmented spots with a clearly defined edge. They may occur anywhere on the body and vary in colour from a light brown to black. Solar Lentigines must be monitored as they may develop into skin cancer and melanoma. Melasma is an internally trigger pigmentation that is deeper in the skin’s dermis. It appears on the face as larger brown patches with a non-distinct border. Though specific causes are unknown, it is often stimulated by hormonal increases and is related to either taking or changing hormone based contraceptives. The amount of the peptide alpha–melanocyte-stimulating hormone (α-MSH), triggers melanogenesis and this is raised during pregnancy. American studies have shown Melasma occurs in 10–15 percent of pregnant women and in 10–25 percent of women taking oral contraceptives. – Kang, H. Y., & Ortonne, J. P. (2010). What should be considered in treatment of melasma. Annals of Dermatology, 22(4), 373-378. The condition is made worse with UV exposure and some medications such as statins and anti-depressants. Post Inflammatory Hyperpigmentation or PIH for short is a response to injury of the skin. It can be the result of acne, burns, friction or aggressive clinical treatments such as chemical peels, dermabrasion, laser and IPL. This condition often resolves itself with time, once the skin has time to heal. However times can vary depending on the degree of inflammatory response within the skin. PIH generally responds to topical products, although it can recur if using aggressive forms of treatment. Melanogenesis is a sophisticated process, with multiple pathways and opportunities to intercept. Therefore the treatment of hyperpigmentation must be equally sophisticated. Traditionally hyperpigmentation has been treated using acid based chemical peels to exfoliate the skin. Exfoliation alone is not always the most success way of treating hyperpigmentation. Furthermore using aggressive acid peels triggers the inflammatory cascade, which can lead to further pigmentation disorders such as Post-Inflammatory Hyperpigmentation (PIH). Post-Inflammatory Hyperpigmentation (PIH) is as a result of the inflammatory cascade stimulating the production of melanin. It is therefore logical, if the client is of a higher Fitzpatrick skin type and prone to PIH, then it would be counterintuitive to treat the skin with further inflammatory treatment modalities. In other words, you wouldn’t fight fire with fire. If heat and inflammation were the initial cause of the problem, then why cause further trauma and inflammation to treat the concern. A multi-phased approach using correct ingredients in home care and gentler treatment programme is most effective. Using Tyrosinase inhibitors ingredients in your home care to help regulate pigment production. Alongside using non-agressive metabolic peels that work on a deeper level with corrective ingredients such as Vitamin A. Unless using deep peels such as TCA or Phenol Peels (both of which can trigger PIH), most alpha hydroxy acid peels work fairly superficially. The melanocyte resides at the stratum germinativum, therefore beyond the reach of most acids. Using Metabolic Peels that a Chirally Correct can help to reach the target site. Metabolic Peel incorporate encapsulated Retinol, so instead of simply exfoliating the skin, it increases the skin metabolism. Vitamin A also helps to regulate skin function, including melanocyte and keratinocyte activity. Therefore helping to regulate pigment production and distribution to the keratinocyte cells. One very popular Tyrosinase inhibitor is Hydroquinone. A phenolic compound that blocks the conversion of dihydroxyphenylalanine (DOPA) to melanin by inhibiting tyrosinase. Hydroquinone also works by increasing the cytotoxicity of melanocytes (melanin-producing cells). Essentially, this means that hydroquinone can kill melanin-producing cells within the skin. Products made outside of the EU and US, in countries such as Mexico, Africa and Middle East are shown to contain trace amounts of Mercury. While Hydroquinone is very popular amongst medical professionals, due to it’s toxic effect on the skin it can cause rebound issue. Resulting in even further pigmentation. In the EU it’s banned in concentrations that are higher than 1% and is not recommended for long term use. Instead we recommend safer, plant-based Tyrosinase inhibitors that help to regular pigment production without causing damage to the melanocyte. Therefore safe for long term use. Treating hyperpigmentation too aggressively with strong acids can cause the condition to worsen. However there are some acids, when used at the correct strength and pH, have been shown to be beneficial. While reducing the risk of PIH in darker Fitzpatrick skin types. Lactic Acid – a larger molecule alpha hydroxy acid (AHA). Used at pH 2.5-3.0 it is suitable for sensitive skin and darker Fitzpatrick skins. It is also super hydrating and able to boost ceramide production. Mandelic Acid – a stable and large molecule AHA. Studies show it is able to control acne and abnormal pigmentation including Melasma. Pyruvic Acid – when used in low concentrations and combined with Lactic Acid it helps to reduce Melasma and dark patches of pigment. Salicylic Acid – a beta hydroxy acid with proven anti-inflammatory properties. Jessner Solution – a combination of lactic acid and salicylic acid, with resorcinol. It can help to address stubborn patches of pigmentation. 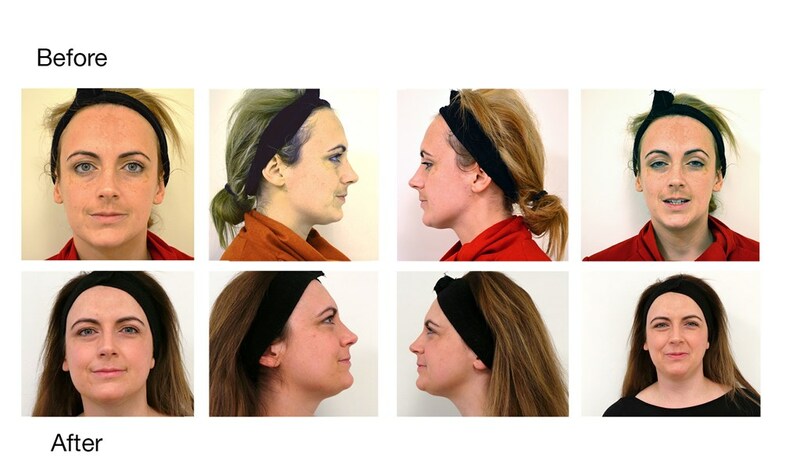 Metabolic peels work differently to acid-based chemical peels. Instead of exfoliating the skin, they work by stimulating renewal without causing excessive trauma or inflammation to the skin. The results are the same as chemical peeling but with reduced risk of PIH or irritation to the skin. Alongside Metabolic Peel we also recommend a sophisticated home care regime incorporating pigment regulating serums with tyrosinase inhibiting ingredients. Plus a combination of similar ingredients used during treatment, including Chirally Correct acids and encapsulated Vitamin A. This not only helps treat the hyperpigmentation but also helps to condition the skin in preparation for higher strength treatments and ensures optimal recovery post-treatment. Niacinamide is also a beneficial ingredient in the treatment of hyperpigmentation. Niacnamide is an active form of vitamin B3. Not only does it increase blood and nutrient supply to the skin, it also helps to regulate the transfer of melanosomes from the melanocyte to the keratinocyte. When combined with retinol and used over the course of four weeks, it improves skin lightening more than compared with using the ingredient alone. it also helps to strengthen the skin’s moisture barrier while improving tone and texture. Of course, no treatment for hyperpigmentation would be complete without adequate and religious sun protection. Because UV exposure is the trigger for melanin production, then sunscreen is an integral part of preventing further pigmentation disorders. This is especially important if undergoing treatment while the skin may be more sensitised than usual. A protect, prevent, regulate and correct approach is therefore best to address all. If you’d like to learn more about treating hyperpigmentation or PIH please get in touch on 0844 855 2499 or email [email protected] Alternatively if you’re looking for a Medico Beauty Institute certified practitioner to help address your pigmentation concerns take a look at our clinic locator.